Memorial Day is first and foremost a special American holiday set aside to remember those heroic individuals who paid the ultimate sacrifice in service to their country. I love that we have this special day to remember them although I am sad that we don't remember them more everyday. In everything we do and in all the freedoms that we enjoy everyday, we should remember the ones who sacrificed so that we can live here in this wonderful country. Our family loves spending this first long weekend of summer together as a family. We enjoyed a little "staycation" this weekend and did lots of fun things together. Grandma also shares her birthday weekend with Memorial Day so we had to add a little birthday celebration into the plans. What could be better than yummy red, white and blue cupcakes from Whole Foods? And I memorialized most of this weekend with my phone camera so please excuse the quality of these pictures. We started Saturday off with lunch at a new place on the way to play some putt-putt. Mami Nora's Peruvian Style Rotisserie Chicken was pretty yummy and unique. The boys both ate all their chicken and could have devoured more. Mine was very good and I made my plate a little healthier with a salad. Next, we headed to Adventure Landing in Raleigh for some putt-putt. We had attempted to play here for Evan's birthday, but the weather did not cooperate. We wish our Canadian friends were with us as planned! Since this is the only putt-putt place in our area, we are glad it is a nice place. Our area of Charlotte had a similar place, but it was not as well kept. Adventure Landing has been here a long time, and I have fond memories of hanging out here when I was in college. They have laser tag, putt-putt, go-carts, an arcade and much more. Mattox and I could not walk this course in his stroller because it has many steps and is not very handicap/stroller accessible. We enjoyed sitting in the shade and having our mid-day meal. Evan got put in the stockade for something...cheating maybe? And Daddy also faced punishment. Brody has advanced in his skill level although I am not sure he equals Evan's competency level at this age. Evan was a putt-putt champ from a very early age. I actually think Evan scored a couple of hole-in-one's on this course. Brody looking for his ball at the end. Sad that his ball disappeared. There was also elephant riding. Look, it's Indiana Jones and Shortround! Hehe! Brody thinks he is a race car driver. Silly boy wouldn't be much of a race car driver because he doesn't like going fast these days. He has been telling me to slow down in the car...even when I am sitting still at a stoplight. I actually think he has developed some motion sickness like his mommy, and he hasn't been feeling well lately. Evan enjoyed shooting some dinosaurs in the Jurassic Park game although I doubt he would really shoot at real dinosaurs because he loves them too much. Haha! Brody pretended to shoot too. We picked up some patriotic cupcakes at Whole Foods for Grandma's birthday. Yes, these are still our favorite cupcakes! We met the family at Outback in Southern Pines for the birthday celebration. Evan enjoys coloring masterpieces whenever we dine out. I did ask Brody to smile for this picture. Sigh. Grandma with her children and grandchildren. Brody showing off his green teeth that he got with his tickets at Adventure Landing. The boys split their tickets and each came away with some loot. You have to love those ridiculous little junk toys and places like this. The kids think it is treasure. On Sunday, we went over to Cary to eat at a new Brixx because we hadn't been to one since we left Charlotte. We love Brixx's woodfire pizza, and I love that I can get my own individual pizza with toppings I like. If we order pizza as a family, I usually have to settle for pepperoni or some kind of meat with no vegetables. My favorite Brixx pizza is called Rustica and has prosciutto, mozzarella, mushrooms, artichoke hearts, kalamata olives, and roasted garlic. Yum! This Brixx is located in a new shopping center and most of the businesses are not open yet. There is a big movie theater/bowling alley combo place that is almost ready to open. I am actually pretty excited to learn that our own little town of Holly Springs will be getting one of these movie theater/bowling alley centers soon as the second phase of one of our new shopping centers is being built now. The same builder is building both of these shopping centers so it should be nice. Our little town is one of the fastest growing areas in the country, and most people here lived here before any of the current shopping areas were built. We also discovered this awesome outdoor sports store that rivals Bass Pro and Cabela's. I had never been in one. Apparently, it is owned by the same company as the popular magazine of the same name. It was pretty cool inside, and my boys loved looking at everything. My boys loved this display of wild animals. That mountain lion looks pretty scary. On the way home, I insisted on stopping for the first snow cone of summer. I couldn't resist getting the vanilla snocream flavor because what could be better than snocream in the heat of summer? It is just the right amount of sweet to still be refreshing. On Memorial Day Monday, we enjoyed a day at home with a little vacation in our own backyard. We got out the boys' pool from last year, and they still had a blast. We had not gotten our key yet to our neighborhood pool, but this was a fun alternative to beat the heat. Brody could have stayed in it all day and did last longer than Evan. The slide is still a decent size for Brody. It has always been too little for Evan although that doesn't stop him. Unfortunately, we had to say goodbye to this pool because the next day, Cocoa found a way to get a hold of it. Daddy had hung it up over our fence to let it dry, and she pulled it down and chewed it up. Sigh. How many things can one dog ruin? Baby Mattox enjoyed keeping cool under an umbrella. Our backyard had the only decent grass in our yard, but Cocoa is also quickly doing damage to it. Brody trying to dump water on Evan. Brody trying to hide from Evan. This baby is just so content outside. Mattox even got in the pool for a little bit. I have always loved this little onesie that I bought for Evan as a baby. I actually like using it instead of a bathing suit because it provides good skin coverage while still being soft. He will soon outgrow it, but I am glad he is getting to wear it a little. Pouring water on one another! That is what brotherhood is all about! On a less happy note, my mind has been occupied by some sad events that occurred last weekend. 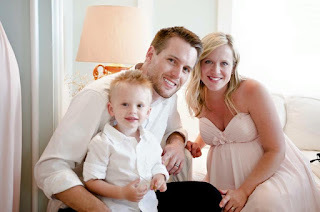 This family from our old church in Charlotte suffered an unimaginable tragedy losing both of their beautiful babies in a horrific car accident. They were on their way back from the beach after he performed his sister's wedding. This photo was taken by the photographer at the wedding. He was the worship leader at one of our Charlotte church's campuses. Their two year old died from the crash, and his wife was 37 weeks pregnant and was rushed into an emergency c-section. The baby fought hard to live but his injuries were too great, and he died the next day. They have two precious little angels in heaven now. I only know a small part of what they are feeling, but I know that only the comfort of our loving God can help them through this. I ask you to join me in praying for this family not to lose their faith at this time. They will see their babies again! It is okay to question God at this time because that is how we communicate with God and He will answer in that still quiet voice I have heard through my own tragedy. I thought this video of the message Pastor David Chadwick, this family and my pastor for years, preached in the wake of this tragedy is applicable to all of us who have suffered the unimaginable tragedy of child loss and ask why. Evan's new next door neighbor friend, Ryan, just turned 10 and invited Evan to his cool Army Boot Camp birthday party. Ryan's dad was in the army and acted as their drill sergeant for the day. The boys thought it was awesome and didn't even mind a little physical labor or the heat. Evan has really gotten a taste for military life lately in both the army and the air force, and I think he likes it. No, I am not sure how I feel about that as his mom. Haha! But honestly, I would be a proud mom if he chose to serve his country one day even if it did make me a nervous wreck. First, the recruits are assigned the task of picking up rocks on the drill field. It was a competition between the two teams, and Evan's team won because one of them collected a really big rock. The Drill Sergeant got a little manual labor out of them because he needed the yard cleared before they began some major yard work to add fresh dirt and sod. Evan and his team racing to collect rocks for their bucket. Yes, they had their faces painted for Boot Camp training. Drill Sergeant checks and weighs the buckets. Drill Sergeant's assistant helps prepare the boys for pinning the medal on the soldier. Yep, they must accomplish the task blindfolded. I asked Evan if he was cheating because he pinned the medal in the correct location right away. The recruit. Birthday boy Ryan is next to Evan wearing similar attire. Evan explaining to Drill Sergeant that he didn't cheat. Preparing to run the obstacle course. Evan got smart to complete this task because he has not developed strong enough arm muscles to cross the monkey bars. We are working on that, but I have always had weak arm strength and could never really do this very well either. He crossed it by climbing on top of the bars. Cooling off with a drink from his canteen. Drill Sergeant shows them how to throw a grenade from their knees. Ryan expertly throws his grenade. Evan does a good job throwing and aiming his grenade. Diving for cover from the grenade. The boys use their remaining water grenades for a little fight. Ryan hides from the other recruits. And tries to elude another recruit with a grenade. Ryan is hungry and leads the way to the mess hall. The boys seek some cool shade to eat their lunch. Then, it was time for some yummy army camouflage cupcakes. I took one to Brody, and he treated the ring like he was Gollum with the one ring. It was his "precious." Haha! Instead of singing happy birthday, they did a cadence. The boys learned how to be army medics and bandage up an injured comrade on the battlefield. Evan was chosen to be the injured for his team because he was the smallest. Ryan was ready for action. Evan's injuries were serious, and he was bandaged from head to toe. Evan's team did not win this match because they were down one man. Carrying Evan on the stretcher. Then, they had a relay race to fill their bucket with water first. And finally, a water gun fight! They are now Army Strong!